Remedy is a weird studio. 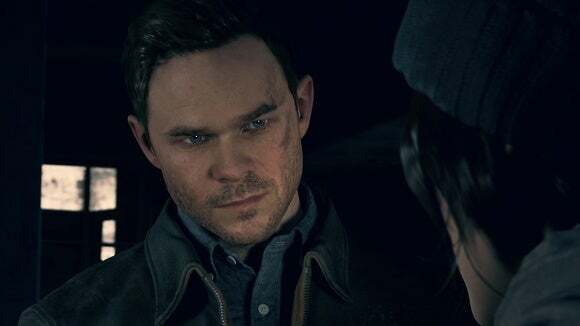 This is my singular takeaway from playing two hours of Quantum Break last week at a preview event—enough time to take me through the first act of Remedy’s hybrid game/TV show (out of a planned five). And uh...yeah. It’s as strange as I thought. And not solely because I think I saw a trailer for an Alan Wake sequel in the middle of it. I’ve seen a lot of Quantum Break trailers, but I don’t think I really understood what the hell it was until I got my hands on it. I mean, hybrid game/TV show? What? The two halves are more separate than I thought. Having only half-paid attention to the game until recently (when Microsoft announced it was coming to the PC too), I’d envisioned something closer to an old-school FMV game. Maybe you’d play for ten minutes, watch some live-action scenes, then play another ten minutes and repeat. Like Metal Gear Solid if Kojima had done all the action in 35mm. Not even close. Instead the TV episodes are proper network length and come at the close of each act. I’ll get into it more later. 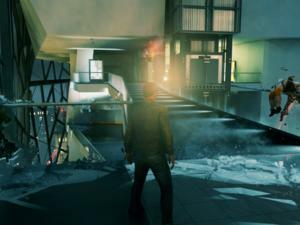 The point is: Quantum Break is more video game than I anticipated. I finished the first act in two hours or so, and an hour and a half of that was standard video game fare. You play as Jack Joyce—an adventurer, a troublemaker, a...I don’t know. Brother to a theoretical physicist? Gun-shooting guy? He’s a nobody, essentially. A nobody that just so happens to have a wildly eccentric brother and a rich best friend. Those two have collaborated to make a time machine in the middle of a college campus, generating a black hole and ripping apart the fabric of the universe. Professors are really taking advantage of tenure these days. Our man Jack is caught in the middle of this whole experiment-turned-catastrophe. The black hole collapses, but not before granting Jack a host of time-warping powers. Powers he mostly uses to shoot a lot of guys. You’ve got your “Freeze time in place” bubble. Your “Bullet-repelling shield made from raw time energy or whatever.” The always-useful “Highlight important objects in the environment for some reason” power. And, best of all, the “Time-slowing dodge maneuver” a.k.a. it’s Max Payne. 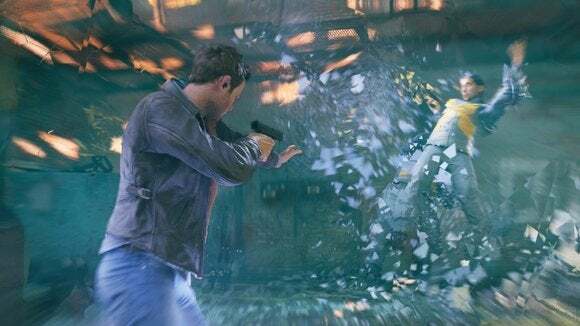 Seriously, Quantum Break plays a lot like Remedy’s original Max Payne games. There’s no Matrixesque slow-motion dives and somersaults, but Jack essentially teleports ten feet away and then time slows down for a second or two while you pop off shots. Welcome back, bullet time. This is in addition to Remedy’s other signature touches, like pausing to listen to fake radio shows or Jack’s internal monologuing. 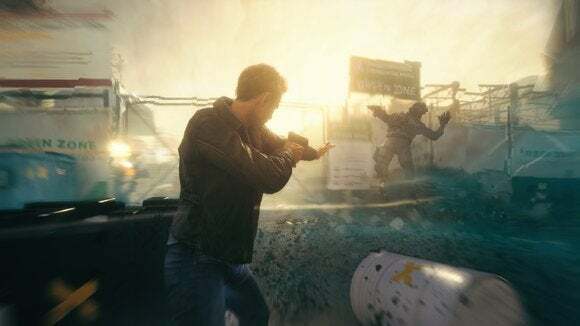 Quantum Break is...well, it’s Remedy. Bold, sort of crazy, and plenty intriguing. Then there’s the TV aspect. I won’t get heavy into spoilers, but suffice it to say the first Act (and presumably this also applies to the other four) was capped by a major Telltale-style “Choose This or This” decision and then we got into Quantum Break: The TV Show Stuff. 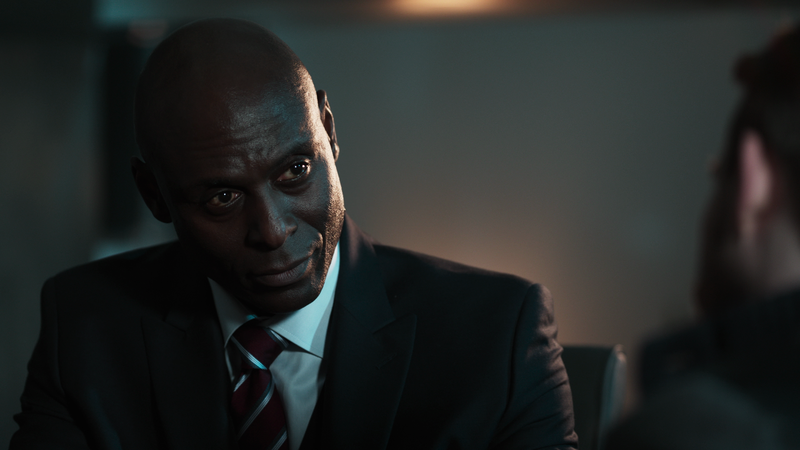 The acting is top-notch, thanks to a few heavy hitters (like always-intimidating Lance Reddick) and a cadre of lesser-known but equally-talented actors. And it’s incredible that the game’s models are so polished—like, LA Noire polished—you can tell who’s who with no trouble after switching from game to show. This is a screenshot. Of the Xbox version. I’m also curious to see how the player choice aspects play into the show as you get further in. The first episode obviously sports one massive difference due to your last-minute decision, but it otherwise doesn’t do much with that pseudo-interactivity. It’s hard to know how much agency players have in the story. But at the moment, I just don’t understand. I didn’t clock it, but I think the episode was around half an hour. It felt longer. I generally feel bad if I realize I’m checking my phone during a game. I checked my phone a lot during the live-action bit of Quantum Break. I didn’t really get an answer. From what I can tell, the sole reason is “Because that way Remedy can trick you into watching half an hour of exposition,” and if that’s the case I don’t think they’re entirely successful. 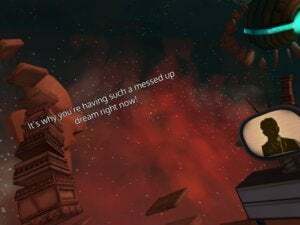 It still feels like watching a half-hour cutscene, the controller resting nearby on a desk reminding you that you’re not playing the game at the moment. I could’ve kept playing after the first episode, could’ve jumped into Act Two, but by that point I felt tired and drained. All my forward momentum had been lost. Don’t think of this as passing judgment, per se. I still left with positive impressions, and I think it could be interesting to play one Act per night or per week or what have you, with the live-action episodes serving as a natural breaking point. I didn’t see anything to convince me the live-action aspect is more than a gimmick, though. Last but not least, we’re forced to discuss Microsoft’s role here. Namely, the fact this game is a Windows 10/Windows Store exclusive. 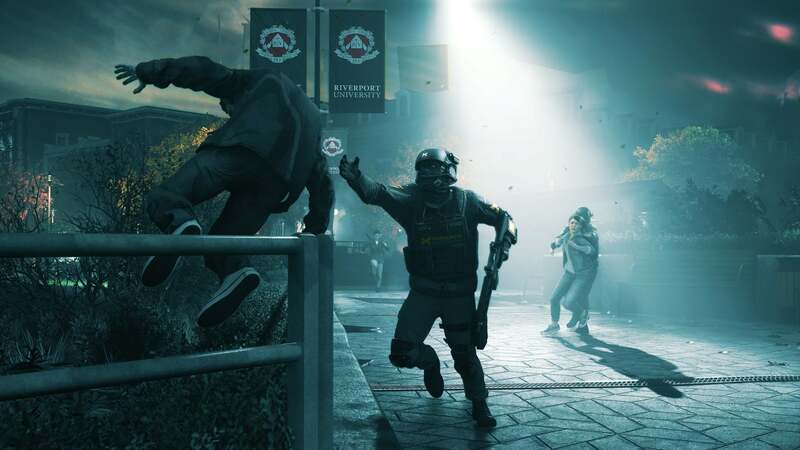 You won’t be able to play Quantum Break on Steam, or even Windows 7 or 8. It’s a troubling decision and flies in the face of Microsoft’s recent “We care about the PC” rhetoric. Microsoft is, of course, allowed to do whatever it wants with its games, but when titles sold through the storefront can’t even support (due to the limitations of the Universal Windows Platform format) simple features like frame rate counters, disabling V-sync, true fullscreen, or multiple graphics cards, then the specter of the Games For Windows Live nonsense rises again. Microsoft can wage some silly war with Valve if it wants, but it’s players and developers who are being hurt by this. Microsoft gaming head Phil Spencer says the company's working to fix the most egregious flaws of Windows Store games. We'll see how long it takes for those issues to be settled. I trust Remedy. I say that about very few developers, but their track record is flawless. Max Payne, Alan Wake—classics. And not just classics. They’re games that took strange risks for the purposes of story. Maybe not as strange as “including a season of a TV show amidst the game portions” but still pretty crazy. Point being: Quantum Break is weird, but I want that. Hell, I expect it. And I guess I’ll be upgrading to Windows 10 before April. Congrats, Microsoft. You strong-armed me.